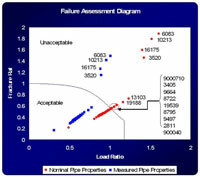 Pipelines are routinely examined with in-line inspection tools for corrosion and cracking. Often this information is not exploited to provide a cost-beneficial integrity management program. In order to implement or make the transition to planned preventative maintenance, pipeline assets must be characterized in more detail. Pipelines have a cost to install, a life-cycle, a cost to maintain, and then – ultimately – a cost to replace. Minimize your costs with accurate, timely assessments from Lamontagne Pipeline Assessment Corporation.